Traditional strategic planning is largely decorative. A decision-focused approach is more holistic and drives business strategy, becoming the engine of a healthy, thriving business. What does “decision focused” mean? Decision-focused strategy simply acknowledges that minor decisions are being made constantly, and major decisions need to be made on a regular basis. Traditional strategic planning methods (such as budget planning or departmental planning) are done annually and then sit quietly until they’re pulled out again next year. In contrast, decision-focused methods involve continuous assessment and optimization. The obvious danger is in the strategy not supporting business goals. The hidden danger is when strategy becomes de-valued internally as managers make decisions outside of the strategic framework. Communication breaks down, goals become murky or forgotten and disengagement begins. In the digital age things happen quickly. Markets are moving at the speed of light, individuals are broadcast networks, and opportunities can present themselves just as quickly as they fade away. 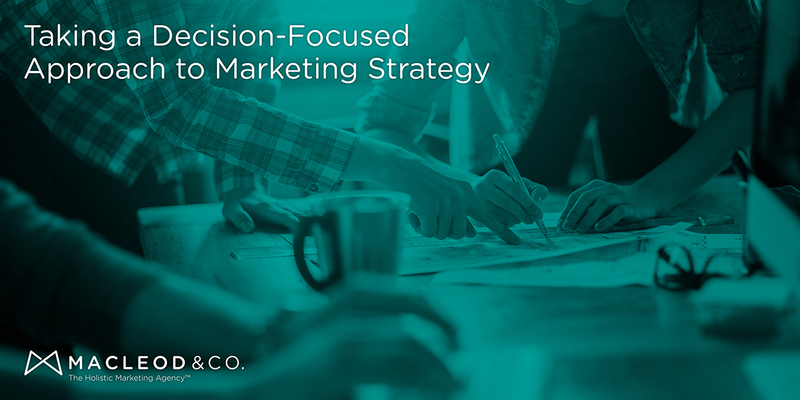 Good marketing strategy guides and supports decision-making, which makes goals clear, fosters communication and ideation, and drives engagement. Strategic Planning is done on-high, and stays there. Strategic Planning is done and dusted. Never re-visited again until the next year. Strategic Planning is inaccessible or considered above anyone’s pay grade. Strategic Planning is communicated throughout the organization and made accessible and relevant to all. Strategic Planning happens regularly, throughout the year, according to a defined framework and visible to all. Strategic Planning is discussed regularly and fundamental to the culture. How do you start a decision-focused strategy? Business processes and planning need to be more than a checklist — they have to be actionable and supportive of your business and how real people operate. Stand behind your strategy and make it an active part of your business. Don’t know where to start? Download our free goal-setting workbook to clarify your goals and set your business on the path to success.